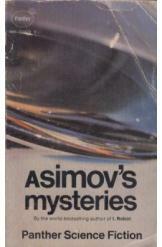 Asimov's Mysteries by Isaac Asimov, Sci Fi. Book is in good condition, all pages intact. A collection of science fiction detective and crime stories by Isaac Asimov, set throughout the worlds of his Foundation and Robot series. Includes "The Singing Bell," "The Talking Stone," "The Dying Night," and a dozen others.